Not heard of it? You probably will do in the future, it’s a term used to describe a technology affected body due to poor posture, and it’s now a syndrome all in itself. So what is text neck? I’d like to say it’s an educational game you play where you get points and prizes, unfortunately its not it’s a pain in the neck! 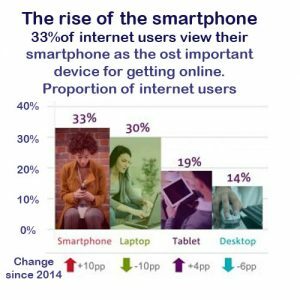 Most of what we do these days is mobile via the iPad/tablet or phone, the old desktop is getting used less and less, and we usually find the laptop that little bit too cumbersome to use while lounging around, playing games or searching the internet with one eye on the TV. You may have not linked these two together and possibly not thought about it, but like anything we do there are consequences, you can brush off little aches and shoulder tension, but pain affects our life more than we realize. Using mobile technology does affect the while body, now there is a term specifically for the neck pain call “text neck” as it is the position typically taken for using our mobile device. 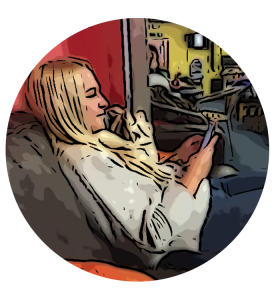 Try it for yourself send a text, noting the posture you adopt and head position, then take a deep breath and notice how when hunched over your breathing is affected, this poor posture can restrict your normal lung function by up to 30%. 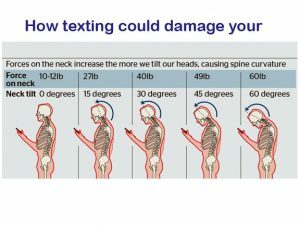 In an interview on CNN last year Tom Di Angelis, president of the American Physical Therapy Association‘s Private Practice Section said the effect of text neck is similar to bending a finger all the way back and holding it there for about an hour or so. How long do you spend looking down? We’re spending two hours online on our smart phones every day; twice as long as laptops and PCs. Superfast 4G is helping change the way we shop, bank, watch TV and communicate. If you think of the time you spend on the phone, tablet/iPad what does it mean for children who are really going for it, the dilemma whether to let your child have a mobile phone strongly argued by many. I know personally my oldest son gets homework which he carries out on a tablet device, and when together with friends and cousins the tablets come out. He plays Scrabble, Chess and Draughts via an app! He’s even beaten me at Draughts on the iPad. It is estimated that you can add a further 5,000 hours to that total for teenagers. Its sounds quite heavy this lot, so how heavy is it? Let’s work it out, the average head weighs about 5.4 Kg/12LB, however when leaning forward the pressure increases, a bit like holding a bag of sugar close to your chest , then holding it at arm’s length out in front, suddenly the effect increases quite dramatically. Here are a few figures for you to make sense of it. So let’s think about this, that last position has the same effect of carrying a child around on your neck, 27Kg/60LB. Having carried my kids on my shoulders on many occasion I can still feel the burn of those actions. 1) Minimize the tilt of your head and neck movement forward. 2) Use your eyes to look down. 3) Adopt a good posture for the whole body. Don’t slump or lean (left, right or forward) in your seat and don’t tuck them under neath. Use a proper lumbar support. Make sure your feet are in proper position – flat on floor. Move occasionally; remember to stand up and try to move or walk around once an hour. Set a timer on your phone to remind yourself to get up. When you do get up stretch a little to stretch, have a routine planned. Do be active and try to get at least 30 minutes of physical activity per day. These are simple tips to help, however to make a real difference in addition to these look to improve your overall strength and flexibility performing regular exercise for the neck and whole body, thereby improving overall mobility, flexibility and strength and in doing so the body can handle your lifestyle, habits are easier to work on when the body is able. This is a vital note as often when someone attends the clinic in pain, we need to reduce the pain by reducing tension on the tissue causing symptoms, then improve movement, flexibility, strength followed by correction of postural influences at rest and work. This is a lot for you and your body to handle being particularly difficult for anyone in pain. Consider the information and try to manage as best you can, you know where we are if you need us. PS:If you enjoyed reading this article please like and share and help us spread the word.